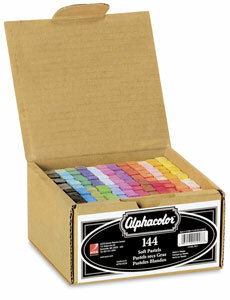 Alphacolor Soft Pastels are rich in pigment, with a velvety texture. Individual sticks are 2-5/8" long × 3/8" wide, and are arranged in plastic trays. Fluorescents — 12 fluorescent colors. Basic Colors, Set of 144 — 24 primary, secondary, and tertiary colors, with six sticks of each color. Multicultural Portrait Sets — A collection of 12 or 24 flesh tone colors. Earth Tones — A distinctive collection of 12 natural autumn colors. Hi-Fi Grays — A set of 12 sticks that includes two each of Gray, Dark Gray, Medium Gray, Light Gray and Very Light Gray, plus one Black and one White. Basic Colors, Set of 12 — Primary and secondary colors. Basic Colors, Set of 48 — Primary, secondary, and tertiary colors, plus two blacks, two whites, four different grays, and four different fluorescent colors. Basic Colors, Set of 24 — Primary, secondary, and tertiary colors. White — Three sticks of White. ® Alphacolor is a registered trademark.